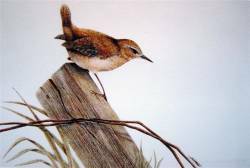 Wren by Nicholas Day Prints A chance to own a signed, limited edition picture, (only 50 printed), by a notable Wildlife Artist using an original medium. At an affordable price! ABSOLUTELY WONDERFUL PRINTS...PACKAGED WELL...A+:VIVIAN MADAUX - U.S.A. Image shown,"Wren Eyeing Bug On Fence Post"in an acid free mount.Size of the print is 12" by 15"(38cm by 30.5cm)This is signed and numbered limited edition of 50 only.Printed to a very high resolution and standard, on superb quality paper with fast inks to guarantee total colour strength for at least 80 years under normal conditions.You will be very impressed with the price and the quality of this mounted print. Where does it live? Breeding, Mainly in deciduous and mixed woodland, with plenty of thick undergrowth. They spill over into hedgerows, orchards, park and gardens, and are also found on moorlands and islands. Where to see it Found across the UK in a wide range of habitats - woodland, farmland, heathland, moorland and islands. Most are found in deciduous woodland but it is least abundant in Scotland and northern England, with the smallest numbers found in upland areas. A regular visitor to most gardens. What does it sound like? A loud ringing, warbling song; a loud, rattling call. When to see it All year round. Did you know? The scientific name troglodytes literally means cave-dweller.